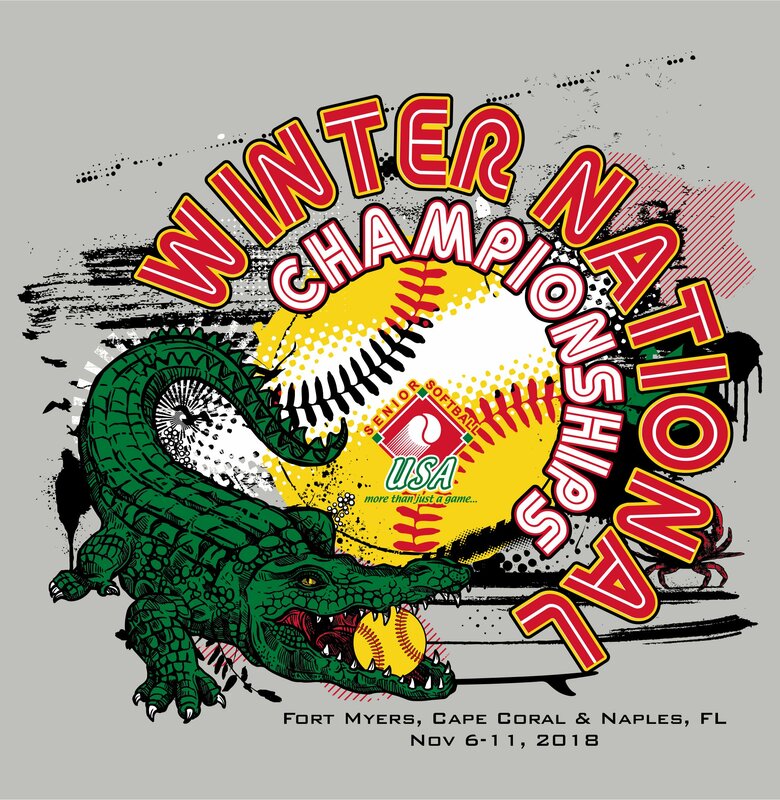 FT. MYERS, Fla. – The 18th annual Winter National Championships continued to be a staple among the Senior Softball USA qualifiers east of the Mississippi River, with 105 teams from 20 states competing in 2018 here. Winning teams from each division earned their invitation to the 2020 original Tournament of Champions (TOC). The tournament started with the Men’s 65-85 age divisions playing Nov. 6-8. 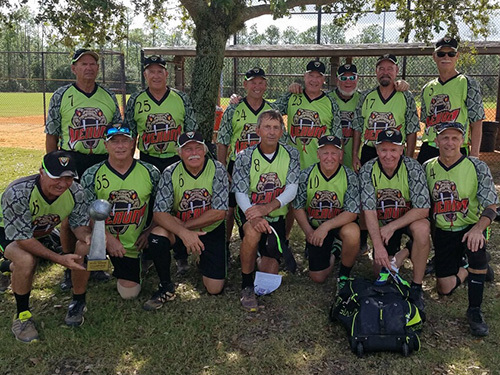 Beginning with the three-team Men’s 65/70 Major Plus Division, Venom (FL), Men’s 70 Major Plus, posted a perfect 2-0 record in bracket play, with wins over New Jersey Hitmen (24-7) and Team Florida (34-12), in the championship game. As the highest finishing Men’s 65 Major Plus team, Team Florida would also earn a TOC bid. 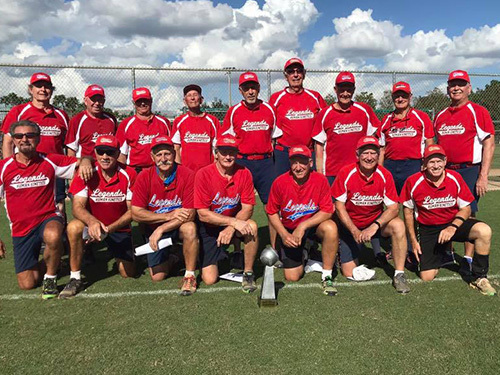 In the four-team Men’s 65 Major Division, Beef O’Brady’s Southern Trace (FL) avenged their 23-10 loss in the championship game against Who’s On First (FL), with a 19-11 victory in the “if” game. Who’s On First dropped their first game of the bracket, against Beef O’Brady’s Southern Trace (25-12), before bouncing back with three straight elimination wins, including the championship game, en route to their runner-up finish. AMR South (FL) finished third. 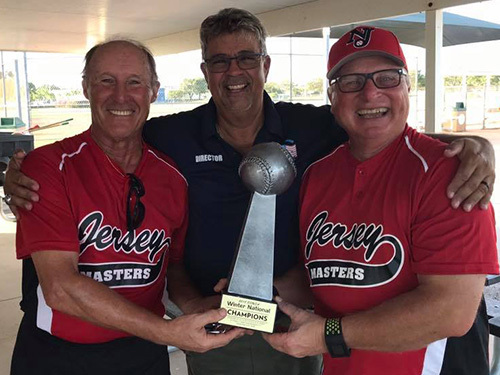 In the nine-team Men’s 65 AAA Division, Jersey Masters Red went 4-0 in bracket play, including a 26-9 win over top seed Long Island Jaguars White (NY) in the championship game. LI Jags White dropped their first game of the bracket, 22-15, against No Stars (FL), to fall into the elimination side of the bracket. Facing elimination, LI Jags White rattled off four straight wins, including three straight on championship Thursday, before running out of gas in the championship game. Studz (WI) finished in third place. Playing a best two-out-of-three game series, Kentuckiana (IN) swept Action Auto Parts (RI) by scores of 26-14 and 22-7, respectively, to win the Men’s 65 AA Division. 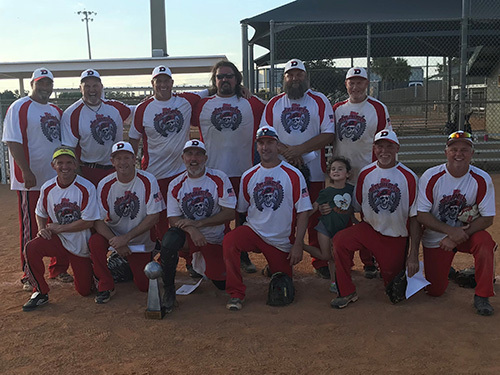 In another four-team division, the Men’s 70 Major Division, Michael’s/Handeland (WI) bounced back from an 0-3 showing in seeding play, to go 3-0 in bracket play, including a 14-10 win over Minnesota Prize in the championship game. CC Medical Services (NY) finished in third place. 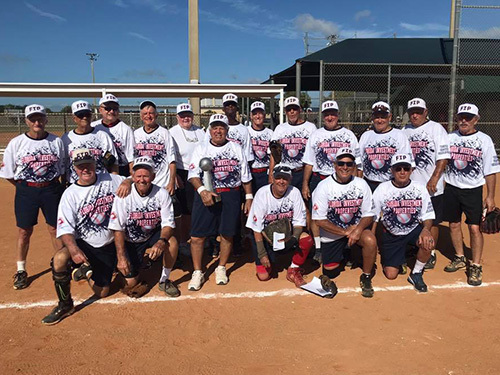 In the largest division of the tournament, the 11-team Men’s 70 Silver Division, Bradford White/Jersey Masters (NJ), AAA, came back to win the “if” game 24-10 after dropping the championship game 19-12 against Lane Construction (FL). Florida Southern Force finished in third place. Top seed Delaware Auto Salvage finished in fourth place, as the team was upset in their first bracket game 15-14 against Long Island Jaguars Red, before winning three straight games in the elimination side of the bracket. 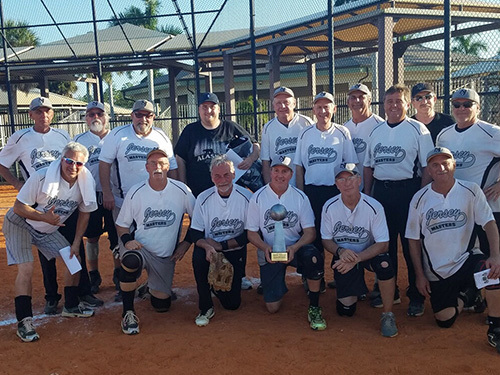 Florida Legends (Major Plus) won the three-team Men’s 75 Platinum Division, going 3-0 in the bracket, including a 16-9 win over Monkey Joe’s Big Nut Co. (NJ) in the championship game. As the highest finishing 75 Major team, Monkey Joe’s also earned a TOC bid. Chadwell Supply (FL) finished in third place. The eight-team Men’s 75 AAA Division featured a full seven-game round robin to determine the champion. Four teams finished with an identical 5-2 record, as Chicago Gray Sox (IL), Jersey Masters (NJ), Long Island Jaguars (NY), and Syracuse Cyclones (NY), all tied for the top spot. The tie-breaker would come down to head-to-head meetings within the four teams. Jersey Masters and Syracuse Cyclones each posted a 2-1 record within the group of four, with Jersey Masters earning the tie-breaker via its 15-7 victory over the Cyclones. Chicago Gray Sox and Long Island Jaguars each finished with a 1-2 record within the top four, with Chicago Gray Sox earning the third-place finish, via its 23-21 win against the Long Island Jaguars. The remaining division included Senior Red Birds (MO), 4-3 record; Indianapolis Classics (IN), 3-4 record; and Carolina Blue Sky’s (NC) and Bailey Cavaliers (VA), 1-5 record each. 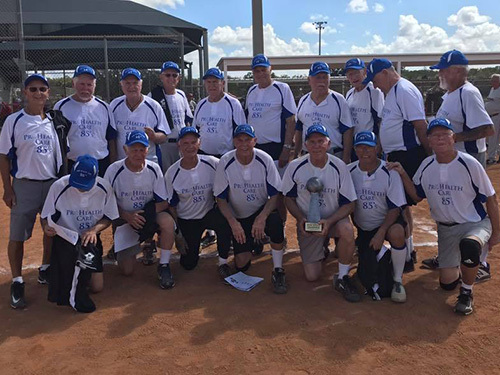 Florida Investment Properties (Major Plus) and New York Statesmen (Major) played a best two-out-of-three game series for the Men’s 80 Platinum Division. With respective scores of 13-10 and 28-7, Florida Investment Properties would go on to earn the sweep. The five-team Men’s 80 AAA Division featured a full four-game round robin to determine the champion. Cape Code Sharks (MA), Chicago Geezers (IL), and Peach Tree Restaurant (PA) all finished with identical 3-1 records. The teams were still be tied following the first tie-breaker, as all three teams defeated each other for identical 1-1 head-to-head records. Following the next tie-breaker, least runs allowed within the head-to-head meetings, Chicago Geezers (24) would earn the first place finish, followed by Cape Cod Sharks (26) and Peach Tree Restaurant (29). ProHealth Care (WI), 1-3 record, and Bucs and Bulls (FL), 0-4 record, rounded out the five-team division. 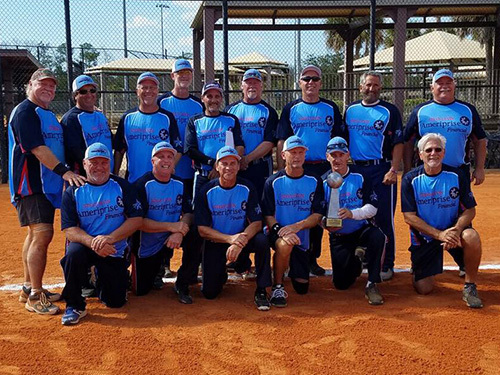 Center For Sight (FL) and ProHealth Legends (MN) played a best two-out-of-three game series for the Men’s 85 Major Division. ProHealth Legends struck first taking the opening game, 14-3; while Center For Sight edged out an 11-10 victory in game two to even the series. Center For Sight scored a pair of runs in the top of the open to complete the comeback win. In the winner-take-all rubber match, ProHealth Legends earned an 11-10 win of their own, scoring a run in the bottom of the open to complete the walk-off victory. All teams 80 and over receive an invitation to the TOC. The tournament resumed Nov. 9-11, with the Men’s 40-60 age divisions taking center stage. 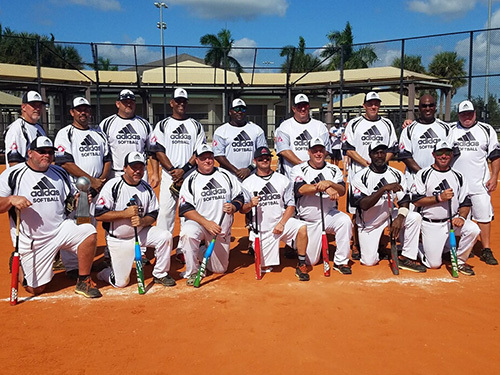 Leading off with the Men’s 40 Platinum Division, Suncoast Adidas (FL), Major Plus, swept S2S/.40 CAL (FL), Major, by scores of 26-18 and 28-24, in the best two-out-of-three game series. In the three-team Men’s 50 Platinum Division, Suncoast Adidas (FL), Major Plus, posted a 3-0 record in bracket play, including a 23-19 win over Brickyard Classics (IN) in the championship game. As the highest finishing 50 Major team, Brickyard Classics would also earn a TOC berth. AMR-DLB (OH) finished in third place. 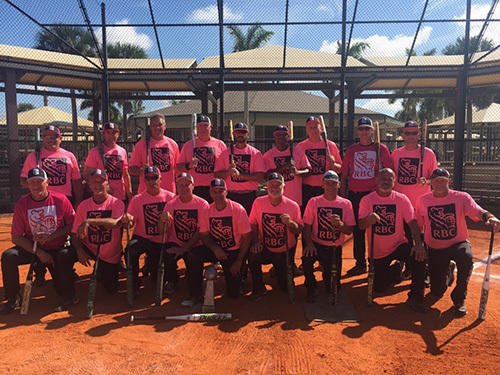 In the nine-team Men’s 50 AAA Division, Depend On A Friend Foundation (FL) had a solid debut, going 2-0 in seeding play to earn the top seed, before posting a 4-1 record in bracket play, including a thrilling 18-17 win over Public Enemy (FL) in the “if” game. Public Enemy forced the “if” game with an 18-17 win of their own in the championship game. 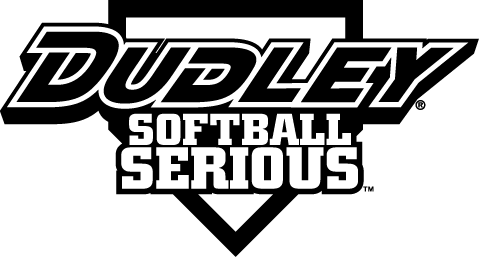 Depend On A Friend Foundation defeated Public Enemy, 16-11, earlier in the bracket, to advance to the championship game. Sandlot Softball (FL) finished in third place. Avalon Insurance/50 Caliber (FL), the No. 9 seed, rebounded from an 0-2 showing in seeding play, posting a 4-2 record in bracket play, including three straight wins in the elimination side of the bracket, en route to a fourth-place finish. 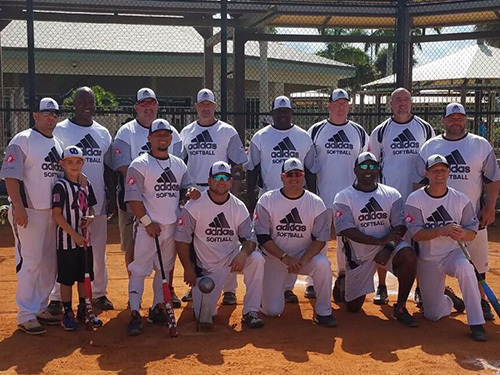 RBC Wealth Management (FL) defeated Suncoast Adidas (FL) in a hard-fought best two-out-of-three game series for the Men’s 55 Major Plus Division championship. 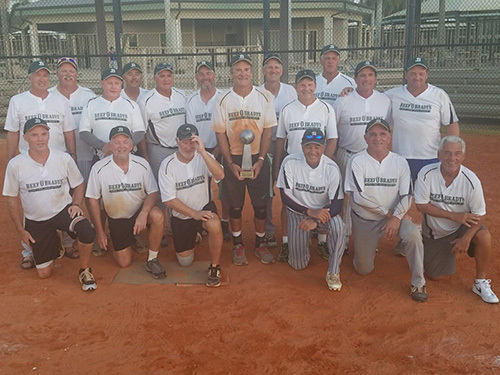 RBC Wealth Management got on the board first, edging out a 20-19 win in opening game; while Suncoast cruised to a game-two win 30-15 to even the series. In the rubber match, RBC Wealth Management took the winner-take-all game, 35-30. Top seed Derby City (KY) posted a perfect weekend in the five-team Men’s 55 Major Division, going 2-0 in seeding play, and 3-0 in bracket play, including a thrilling 14-13 win over Action Auto Parts (RI) in the championship game. Action Auto Parts won three straight games in the elimination side of the bracket, before falling just short in the championship game. Dayton Legends (OH) finished in third place. In the eight-team Men’s 55 AAA Division, No. 3 seed Vecter Scorpions (FL) posted a flawless 4-0 record in bracket play, including a 16-11 win over No. 8 seed Team Illinois/Pias, in the championship game. Team Illinois/Pias made a Cinderella run through the bracket with a 3-2 record, en route to their runner-up finish. Both of Team Illinois/Pias’ losses came against Vecter Scorpions. Ameriprise FL Legends finished in third place. 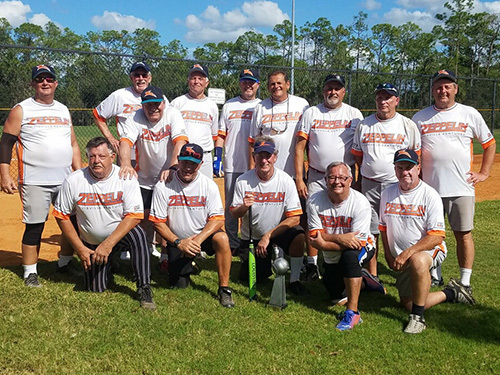 Top seed Florida Stingers won three-team Men’s 60 Major Plus Division, defeating Central Illinois Chiefs 21-11 and then Southern Ruckus (FL) 19-16 in the championship game. In the eight-team Men’s 60 Major Division, No. 4 seed Levin/Ameriprise (FL) went 4-0 in bracket play, including a forfeit win over Chicago Prime (IL) in the championship game. Chicago Prime previously won three straight elimination games, before having to forfeit the championship game due to injuries. Action Auto Parts (RI) finished in third place. In the 10-team Men’s 60 AAA Division, Long Island Jaguars (NY) posted a perfect weekend, going 2-0 in seeding play to eventually earn the No. 2 seed, before going 4-0 in the bracket, including a 16-8 win over Playmakers (WI) in the championship game. LI Jags defeated Playmakers earlier in the bracket 16-14 to advance to the championship game. Cincinnati (OH) finished in third place, after a valiant run through the elimination side of the bracket, that saw the team win four straight games. NE Jackhammers (DE) also made a strong push through the elimination bracket with three straight wins, en route to a fourth-place finish. 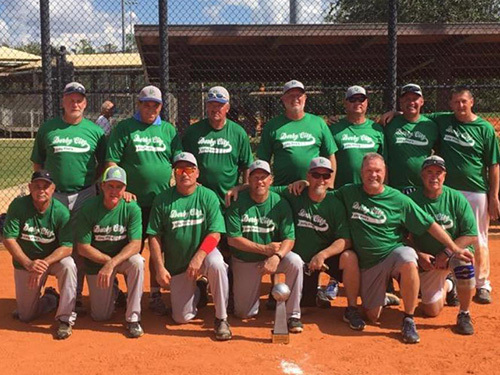 Glory Daze (KY) defeated Ted Todd Insurance (FL) in a best two-out-of-three game series to win the Men’s 60 AA Division. Glory Daze took game one with ease 21-11 while Ted Todd Insurance edged out a win in game two, holding onto a 14-13 victory to force the decisive third game. In the rubber match, Glory Daze won a thriller, holding off Ted Todd by a score of 24-23. Trailing by six, 24-18 heading into the bottom of the open, Ted Todd Insurance plated five runs, falling just short of the comeback. CLICK HERE for game-by-game scores.